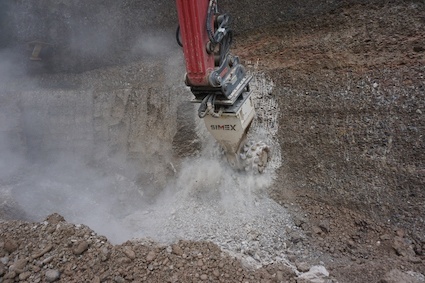 Simex now offers one of the broadest portfolios of equipment for applications ranging from road maintenance to utilities installation, recycling and demolition right through to quarrying, mining and tunnelling. The portfolio is organised into 25 product ranges with a total of 80 models. Simex has also started construction of a new plant that will allow the company to step up production when completed at the end of 2019, and is expanding its sales network into North America, India and Africa. Simex’s bauma stand will showcase new models designed for the road sector. Among other products on show are different versions of the updated RW 500 wheel saw, together with the CT 2.8 wheel compactor and the ST 160 and ST 200 asphalt floats. Visitors to the stand can view the RS 16, an attachment designed for creating rumble strips, which has the adaptability to perform two additional functions, making it a fully -fledged 3 in 1 attachment (rumble strips, regular milling of asphalt and removal of road surface markings). Representing the family of TF cutter heads, now comprising of 10 models, will be the small but powerful models TFC 100 and TFC 50. The TFC 100 can be mounted on 2.5t to 4t mini excavators, whereas the TFC 50 is designed to be coupled to mini excavators weighing 1.2t to 4t. The TFC 50 and TFC 100 cutter heads can excavate their entire width thanks to an innovative system with a central chain that leaves no areas unmilled, enabling the attachment’s working capacity to be exploited to the maximum. Especially suited to nursery and forestry applications, such as cutting trunks and roots, these attachments prove highly effective for digging small trenches on rocky terrain or excavating small manholes or utility vaults for water, telephone or electrical lines. The TF 50 and TF 100 cutter heads can also be used very effectively for milling walls in prefabricated concrete or for removing plaster. Thanks to the limited weight and size of the prime movers they are coupled to, and their low operating noise, they are ideal for the refurbishment of civil and industrial buildings, an application where their low noise levels in confined spaces are particularly appreciated. At bauma Simex will also launch the new company motto: ‘Heavy made easy’, a concept that sums up the ability of Simex products to make an easier job of what is usually a more challenging and complex task. The new motto is matched with an updated coordinated image, including presentation of new promotional material and merchandising, not to mention a completely renovated stand and launch of the new web platform. 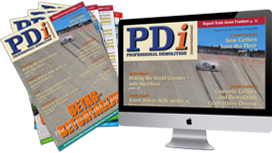 The website offers improved browsing with a special focus on content and direct contact with the company. On 10 April, in a repeat of its success at the last bauma, the company will host an evening gala by invitation to be attended by customers, friends and representatives of national and international trade media.